Delaware 9A joins Interstate 495, U.S. 13 and Delaware 9 with the Port of Wilmington. The south leg follows Terminal Avenue east from Delaware 9 (New Castle Avenue) at the Eden Park Gardens community, to a parclo interchange with I-495 and the port entrance. Christina Avenue angles the state route northwest to U.S. 13 & Delaware 9 (Heald Street) in the Southbridge neighborhood of Wilmington. The 2015 Delaware Vehicle Volume Counts list only references the 0.78 mile section of SR 9A on Terminal Avenue. The Christina Avenue segment is not inventoried as a state route. The route is also not acknowledged from U.S. 13 & SR 9 on Heald Street. Delaware 9A was designated in 1970, when Delaware 9 was extended north from New Castle Avenue to 4th Street west through Wilmington. The state route along Christina Avenue overlays the historic alignment of Delaware 48, which connected the Heald Street Bridge with the Wilmington to Penns Grove Ferry landing until 1951. 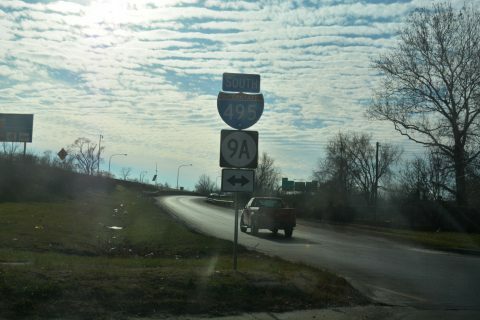 I-495/SR 9A shields posted at the west side ramps for the freeway. Photo taken 12/20/17. SR 9A (Terminal Avenue) heads east through the Eden Park Gardens neighborhood between SR 9 (New Castle Avenue) and I-495. The initial stretch of the route is unmarked. Photo taken 12/18/17. Terminal Avenue enters the parclo interchange with Interstate 495 east of Wilmington Avenue. The southbound entrance ramp leads to U.S. 13 (Dupont Parkway) and I-95/295 near Newport. Photo taken 12/18/17. I-495 elevates northward from SR 9A across the Christina River to Cherry Island in Wilmington and Edgemoor. Photo taken 12/18/17. Signal mast arms were installed in Fall 2017 at the intersection of Terminal Avenue and Pigeon Point Road. Pigeon Point Road heads south to Castlewood Industrial Park and Lambson Lane at New Castle Industrial Park. Photo taken 12/18/17. SR 9A turns back to the north along Christiana Avenue by the entrance to the Port of Wilmington. Photo taken 12/18/17. A SR 9A northbound trailblazer precedes the high level bridge taking I-495 over both Christiana Avenue and the Christina River. Photo taken 12/18/17. This Delaware 9A shield posted north of Terminal Avenue was previously the lone northbound reassurance marker. Photo taken 12/15/99. Christiana Avenue leads through an industrial area ahead of the high level bridge carrying Interstate 495 over the Christina River. The deck plate girder bridge crests to a height of 59.1 feet. The 4,804 foot long span was built in 1974.1 Photo taken 12/18/17. Delaware 9A (Christiana Avenue) advances north across Norfolk Southern Railroad tracks to the Southbridge community in Wilmington. Photo taken 12/18/17. SR 9A (Christina Avenue) concludes at U.S. 13 & SR 9 just south of the Heald Street Bridge over the Christina River. The two routes overlap between Southbridge and the East Side neighborhoods. Photo taken 12/18/17. Second photo taken 12/15/99. The first confirming marker for SR 9A south was posted ahead of the Christina Avenue intersection with Claymont Street south and Canal Street east. The shield was missing by 2007, and eventually replaced with a speed limit sign. Photo taken 08/10/04. Second photo taken 12/20/17. Passing under the high level bridge carrying Interstate 495 across the Christina River. The span closed in June 2014 due to tilting of four support columns. An estimated 55,000 tons of dirt stored at a site beside Christina Avenue caused the failure. Emergency work through the end of 2014 stabilized the supports and corrected the span level. Photo taken 12/20/17. Delaware 9A makes an unmarked turn west from Christiana Avenue and the Port of Wilmington entrance along Terminal Avenue. Photo taken 12/20/17. Delaware 9A (Terminal Avenue) expands to four lanes and crosses a Norfolk Southern Railroad at the Wilmington city line. Photo taken 12/20/17. Terminal Avenue intersects Pigeon Point Road south to Castlewood Industrial Park ahead of the parclo interchange with I-495. Photo taken 12/20/17. Staying just south of the Wilmington city line, Delaware 9A (Terminal Avenue) continues west from I-495 through the Eden Park Gardens community to Delaware 9 (New Castle Avenue). Photo taken 12/20/17. A loop ramp takes motorists from the Port of Wilmington and SR 9A onto I-495 north to Edgemoor, Claymont and Philadelphia. Photo taken 12/20/17. The southbound on-ramp to I-495 serves both the Port and interests from Downtown Wilmington as the freeway leads west toward Interstates 95 and 295 near Newport. Photo taken 12/20/17. Combining with U.S. 13 north, SR 9 (New Castle Avenue) travels from the end of SR 9A through Southbridge, Wilmington toward Downtown. SR 9 south continues to Rogers Corners, I-295, and New Castle. Photo taken 12/18/17. I 495 over CHRISTINA RIVER, N/S RR, New Castle County, Delaware. BridgeReports.com.